The movie even shows the mechanization of eating, where a machine is feeding the individual. He does not have any control over what he eats first or for how long. The corn on the cob is fed to Chaplin way to fast, he cannot eat it successfully. In a more recent movie Reel Steel (2011), is about a boxing robot that is able to compute real human emotion. 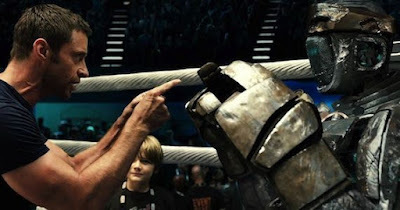 In the last big fight the one of the main character played by Hugh Jackman, tries to level with the robot and get in back into the fight to win. Without using any remote control he goes up to the robots face and talks to it, using gestures to help it to understand. Here once again it shows that robots are taking over aspects of human life, in the movie there are no longer any human boxers, the greats now use robots to fight in the matches. Walter Benjamin writes about how this mechanization is taking away a unique aspect that humans bring to the table whereas machines are just producing the same thing over and over again. Benjamin says “the technique of reproduction detaches the reproduced object from the domain of tradition” (Benjamin 1936). This may be true in the case of Charlie Chaplin; however the movie Real Steel shows that a robot is still unique to the human that has created it. There are many forms of art that had steamed from the emergence of mechanization, and they are very unique. For example in Fred Ables Electric Circus, the artist uses both “animatronics with masterful puppetry” to create what almost looks like real animals and human (Ables). Douglas Davis agrees that the introduction of industrialization has “enhanced, not betrayed” the uniqueness of human created art (Davis 381). The art that Ables was able to create was only because robots were being introduced into the art realm, his are is definitely unique and not a copy. Benjamin, Walter. "The Work of Art in the Age of Mechanical Reproduction." 1936. Print. Davis, Douglas. "The Work of Art in the Age of Digital Reproduction (An Evolving Thesis 1991-1995)." MIT Press, 1995. Print. "Electric Circus Dresseur Der Automaten." Electric Circus Dresseur Der Automaten. Web. 17 Apr. 2016. <http://www.electric-circus.eu/>. HDTVADDICT. "Charlie Chaplin - Eating Machine." YouTube. YouTube, 2012. Web. 17 Apr. 2016. <https://www.youtube.com/watch?v=n_1apYo6-Ow>. Modern times. RBC Films, 1936. Real Steel. Dream Works, 2011. "Sugar Ray Leonard Talks Hugh Jackman & ‘Real Steel’." Screen Rant. 2011. Web. 17 Apr. 2016. <http://screenrant.com/real-steel-sugar-ray-leonard-interview-rothc-134682/>. TheCharlesChaplin. "Charlie Chaplin - Factory Work." YouTube. YouTube, 2010. Web. 17 Apr. 2016. <https://www.youtube.com/watch?v=DfGs2Y5WJ14>.